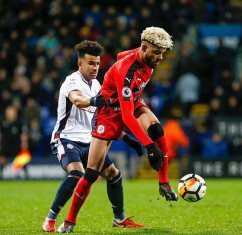 The Danish Football Association are presently ahead of the Nigerian Federation for the services of Huddersfield Town first-team star Philip Billing, allnigeriasoccer.com has gathered. Born in Denmark 21 years ago, the central midfielder holds both Danish and Nigerian nationalities and this could spark an international tug of war between the two nations. Under the stewardship of Amaju Pinnick, the Nigerian Federation have convinced the likes of Ola Aina, William Troost-Ekong, Tyronne Ebuehi, Brian Idowu and most recently Nnamdi Ofoborh to pledge their allegiance to the three-time African champions over their countries of births. Billing first represented Denmark at U19 level and has won four caps to date for their U21 team, but Nigeria could make a move for his services by offering him the chance to represent the country at the 2018 World Cup. Having spent his formative years as a footballer at Jerne IF and Esbjerg in Denmark, Billing joined Huddersfield Town in the 2013-2014 season following a successful trial. If not for an ankle injury that ruled him out of action for three months, he would have made more than the seventeen appearances for the first team of The Terriers this season. Billing has been tipped for big things by former Premier League stars Alan Shearer and Danny Murphy.